I’ve finally arrived at an activity that I’m most satisfied with. 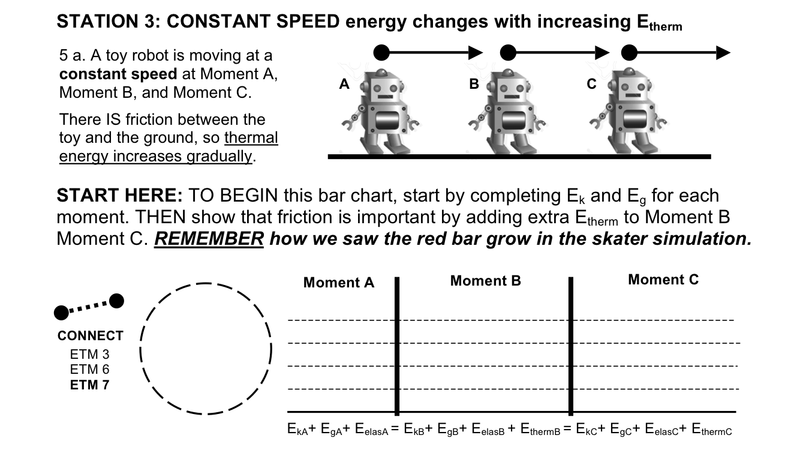 This is very similar toy the Rex & Debbie Rice “Energy Stations” activity, but it takes place later in the unit, once students already have some practice making bar charts and talking about energy transfer. Think “wind up bunny” worksheet, but the key here is that kids are actually working with the stuff. We don’t take for granted that kids understand the idea behind a wind up toy, we use this as one example of many, and give them a chance to see first hand the connection between, say, a rubber band and a pull-back car. The activity consists of three stations, with three pages of a worksheet. Students works through these three stations on one day, then whiteboard their work (with mistakes!) on the following day. 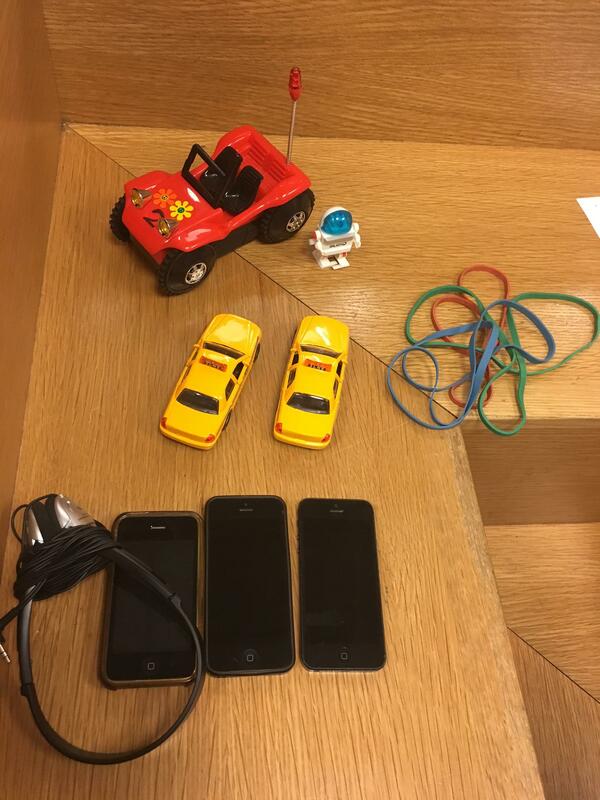 Below shows the equipment I’m using (more on the iPhones in a later post). At this point, students have some experience with energy discussions, and we’ve just looked at the PhET “Energy Forms and Changes” (http://phet.colorado.edu/en/simulation/energy-forms-and-changes) simulation with the girl riding a bike to power a lightbulb or heater to get an example of chemical energy. Since they have some facility with the energy transfer model already, they can actually discuss what’s going on in some detail. The stations can be done in any order, and they all consist of a bar chart (with a system containing all objects defined in the dotted circle) AND a “description of energy transfer” with words. One of them features giant rubber bands that get shot against the ceiling. 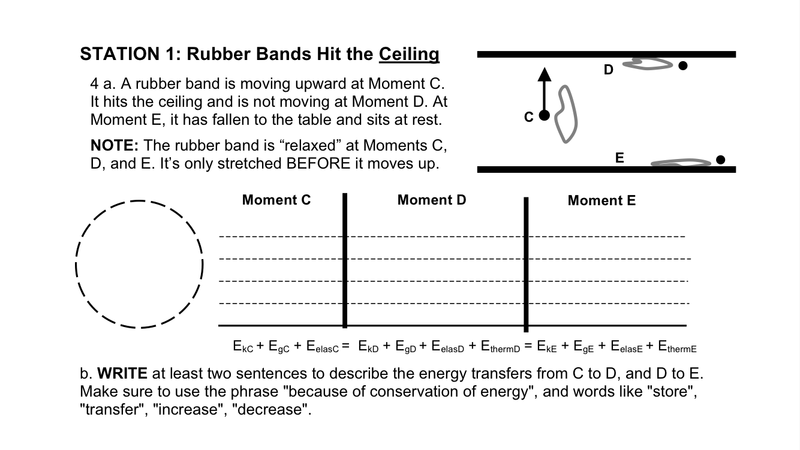 The second half of the worksheet shows “Moments A & B”, where the rubber band gets pulled backward. Station 2 features a pull back car, very similar to the rubber bands, but horizontal. 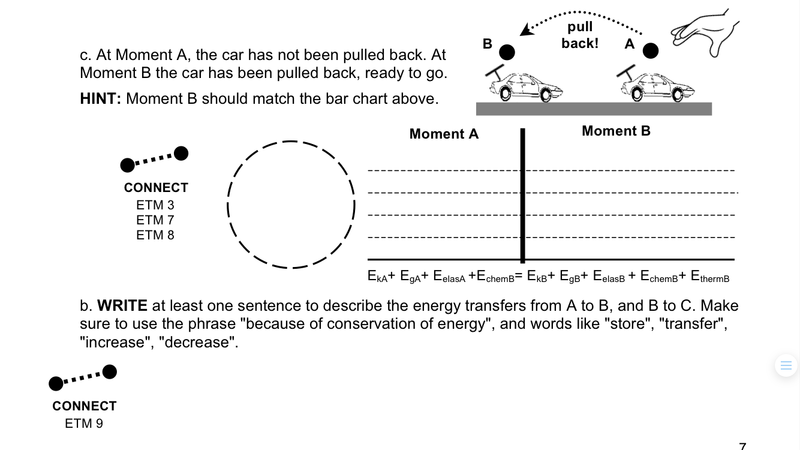 Moment B in the bar chart below becomes the first moment in a sequence where the car speeds up, then reaches a complete stop. Station 3 features the classic “wind up bunny” question, updated to be a robot because these are the windup toys I found (http://www.amazon.com/Fun-Express-Wind-Up-Robots-Dozen/dp/B005NHT092). The second half of this station features the battery operated buggy – same idea but transferring chemical instead of stored elastic.